Here's a strong statement: One of the chairs that made its debut at Clerkenwell Design Week in London might actually change lives. 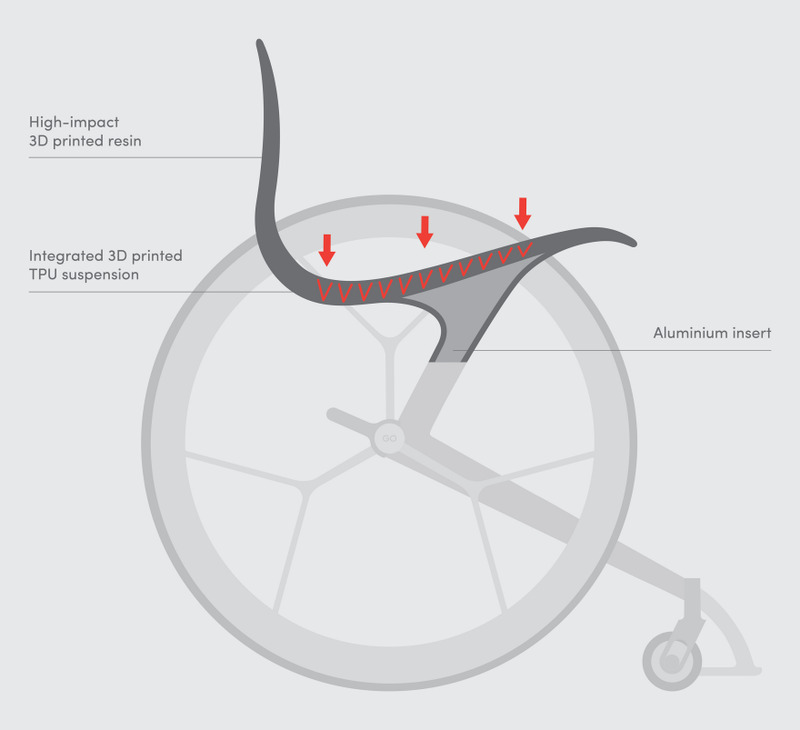 Among abstract panel discussions and amorphous pavilions, experience design agency Layer announced the world's first 3D-printed consumer wheelchair. 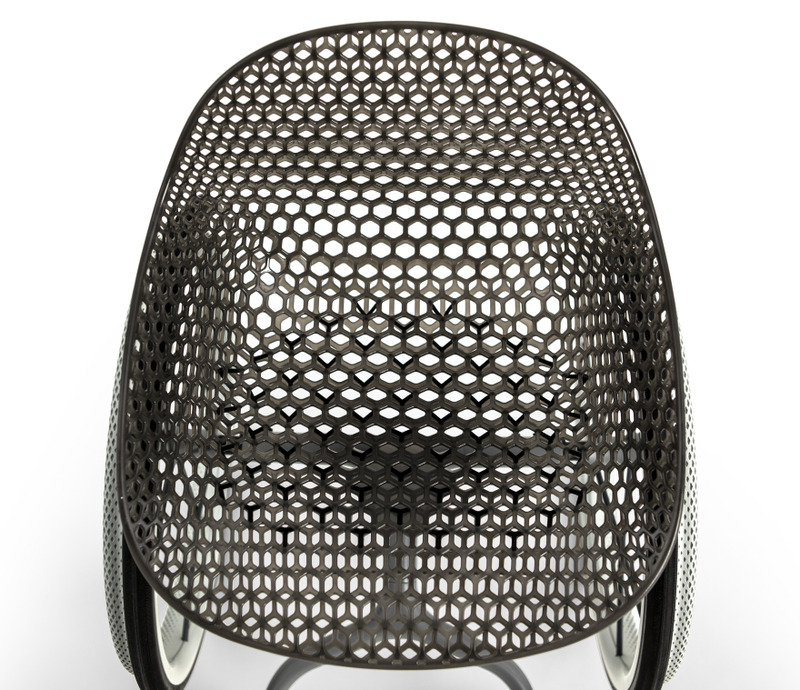 The GO wheelchair was presented as a prototype—the first project under Layer's new research division, LayerLAB, spearheaded by agency founder Benjamin Hubert. "I think what excited me is the potential to really solve a problem, arriving at a solution that users want and need," Hubert says. "Then it was the opportunity to use 3D-printing appropriately. It's not new; we've been using it as a studio for years, but as an emerging technology, it's still not being used fully to its potential." 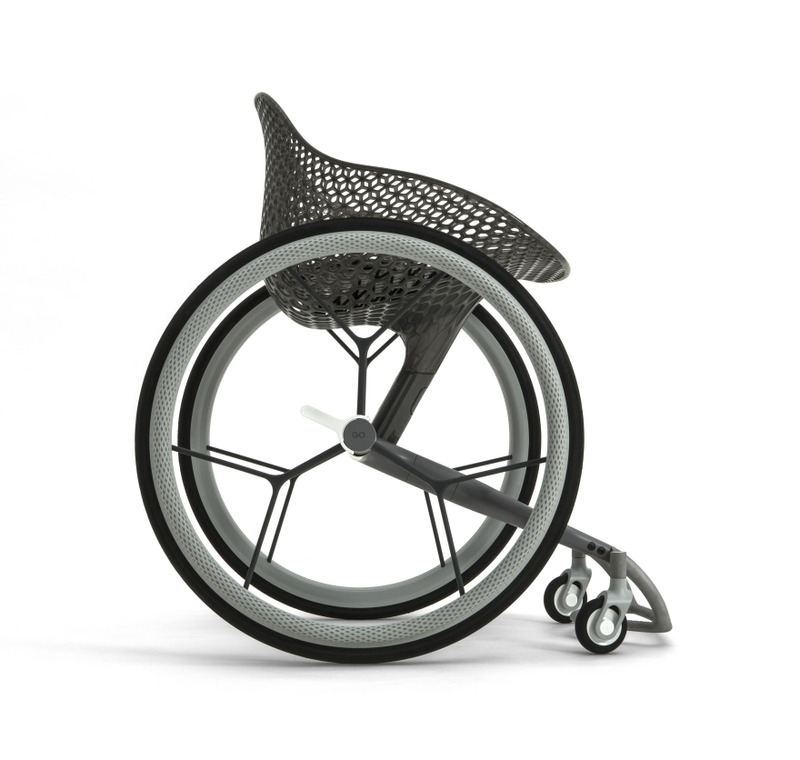 Created in collaboration with Materialise, a leader in 3D-printed software and solutions, the GO wheelchair features several customizable components, elements that can be printed to users' measurements for a unique fit and feel. With new developments in 3D printing, Hubert cites its recent accessibility as a huge game changer and a major reason why this product can exist. "As more of the technology becomes open-sourced, it's becoming a much more feasible option. It's less cost-prohibitive, and lowers labor costs in a lot of ways. 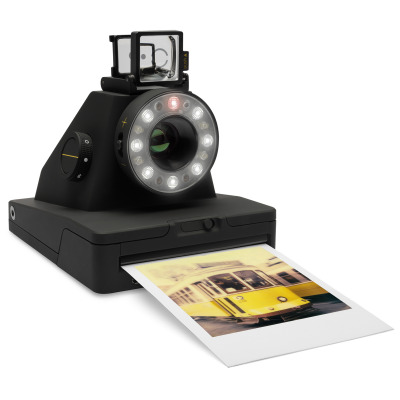 That's also why we're using this technology now." Hubert began the project nearly two years ago back in 2014. "It started just by looking generally at the wheelchair category and, trust me, I've been thinking about that category for a while," Hubert says. "It's quite overlooked. So, I saw a big opportunity to talk to some people about it and create a new product offering for that space." Although preliminary research took about 6 months, Hubert says it continued throughout the entire process. "Of course it doesn't stop," Hubert says. "You continue talking to people throughout the project, getting feedback and incorporating that back into the design." Layer met with dozens of wheelchair users and medical professionals during those 6 months. "There was a lot of intensive work into finding who our target market was and just talking to a lot of people, transcribing that information and using it to pinpoint this new product offering," Hubert says. 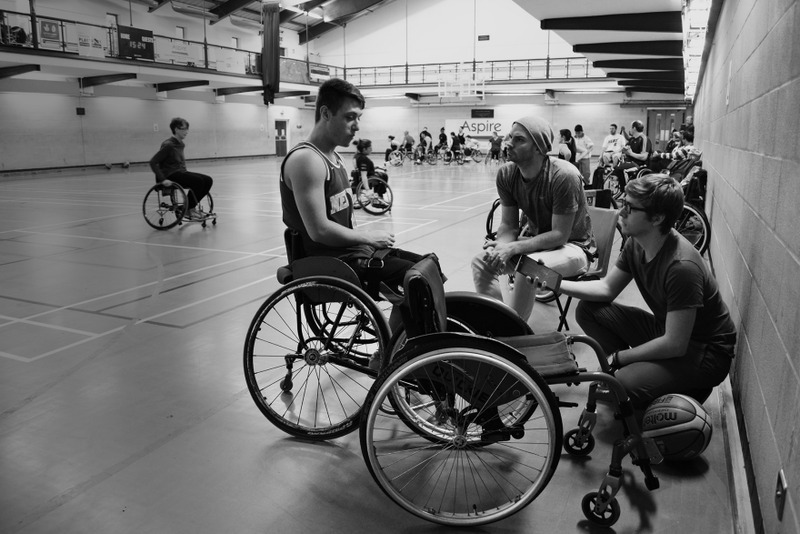 "We did a lot of one-on-one interviews, group interviews, talking to both wheelchair users and healthcare professionals, so that we could really understand their hopes and wishes and then the challenges and drawbacks of that. Their feedback was integral to give us a sense of that category." 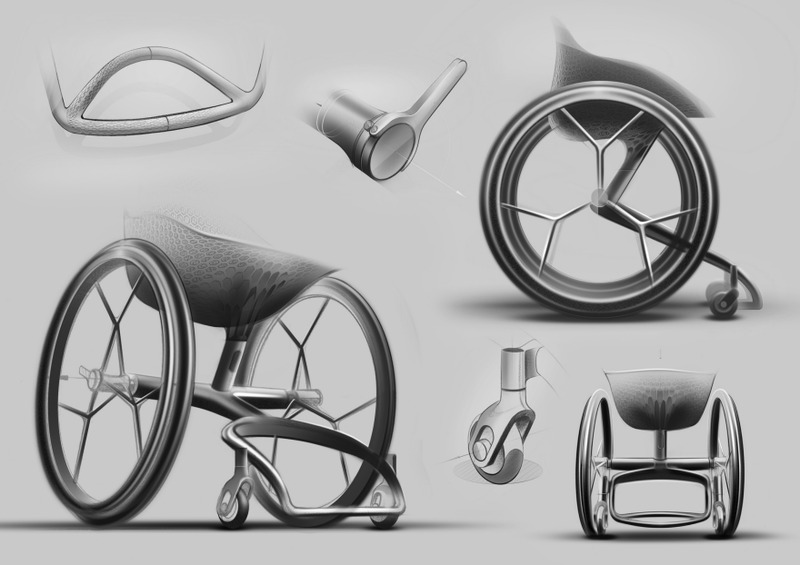 Throughout that process, the studio looked into all aspects of wheelchair use, including how to remove the stigma associated with the product as a medical device, and instead re-position the product as a "human-centered vehicle to improve the everyday lives of users." "A lot [of the existing pain points] had to do with comfort and lack of customization," Hubert says. "A lot of the wheelchairs were not really fit for specific purposes, needs or disabilities, and their shape limited the type of activity or didn't work for a particular landscape or environment. What really fell out of that conversation was that wheelchairs shouldn't be one-size-fits-all solutions." Huber and his team found that users were modifying and adapting their wheelchairs to fit their unique needs due to a lot of moving around and general discomfort, which would often lead to secondary injuries. 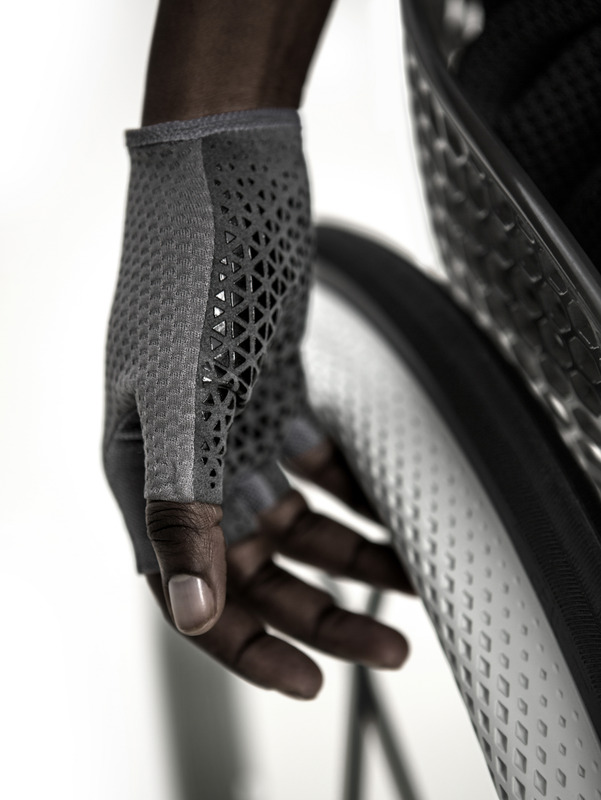 Those insights led the team to GO, a wheelchair comprised of 3D-printed made-to-measure pieces and standard components brought together to create something lightweight and highly functional. 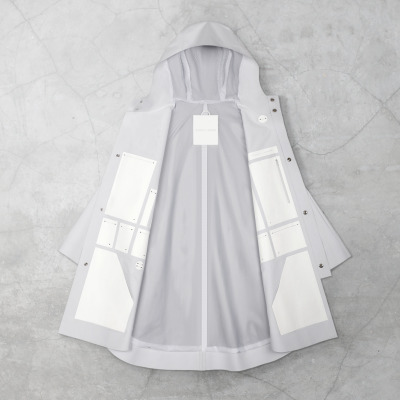 "Most of our design is focused around expressing their point of view, their sense of style, their youthfulness and the features that they wanted," Hubert says. "...And just being able to [let the user] be active in that design process and have some ownership because, ultimately, it becomes an extension of their body." 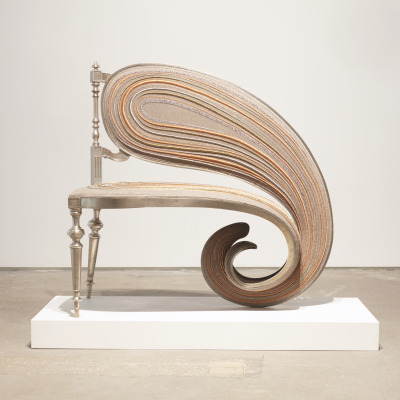 Beginning with a 3D body scan, each user's biometric information is mapped and turned into 3D digital data to create the custom components—a seat and foot-bay. Those two main touch-points control the primary form and allow the GO wheelchair to adapt to individuals' body shapes, weight and disability. From there, users can consult with a healthcare professional to determine any other necessary tweaks to the design. Layer also designed an app to let users specify additional features, patterns, color and other finishes to really make something all their own in what Hubert describes as the "NIKEiD model." 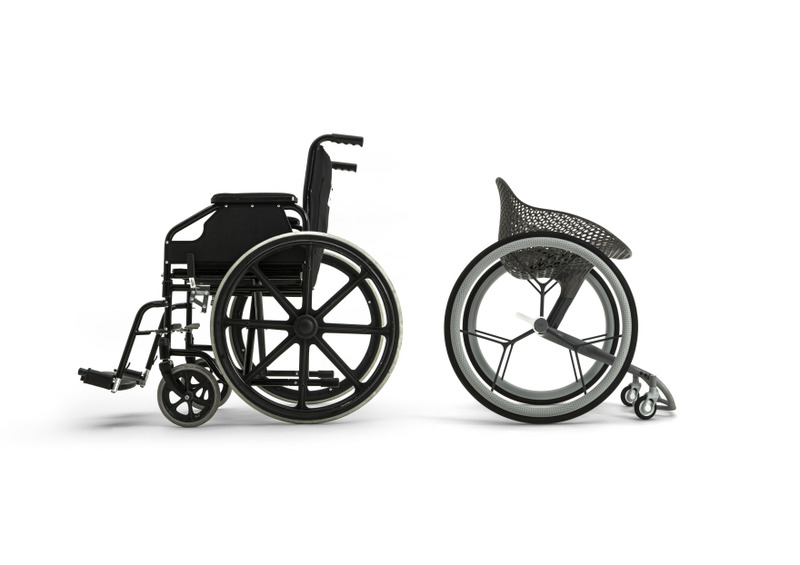 From wheel guards to transfer bars to push bars, there are a range of specifications and features that can be added to the chair. "These are things that are very personal to each individual," Hubert says. "Some people like or need them, some people don't." Once measurements are taken and any additional elements selected, users will be able to place their final order through the app, receiving their custom wheelchair in 2 weeks (compared to the typical 6-8 week lead time associated with current customized wheelchairs). The final chair seat is 3D-printed in a semi-transparent resin with an integrated matrix of TPU that provides shock-absorption, working as a living hinge suspension system to provide comfort for the user. 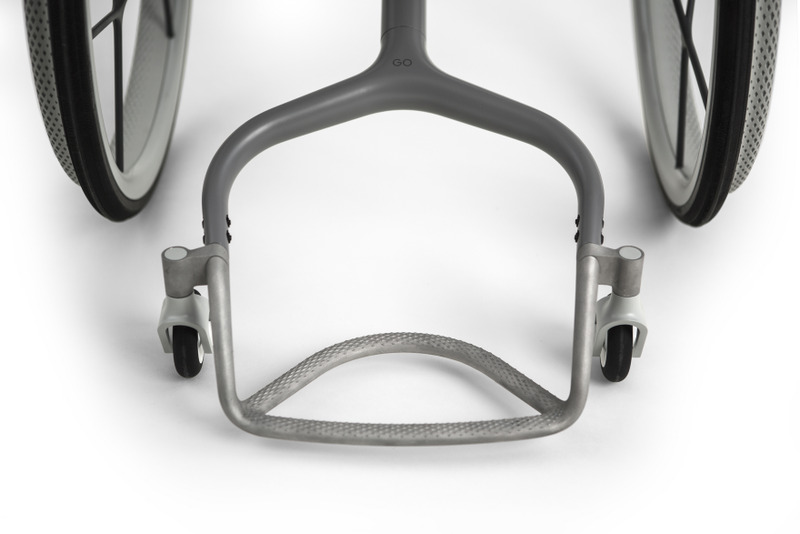 That, in combination with a custom seat with a center of gravity calculated to respond to the user's weight, helps reduce other injuries typically due to pressure points. The foot-bay is printed in titanium with an integrated anti-slip surface texture and a geometry that takes into account the user's leg length, foot shape, and sitting position—all determined by the body-mapping process. The frame has a reduced number of struts, which reduces visual weight while still maintaining functionality. The final touches are wheels with lightweight carbon fiber spokes and over-molded high-grip push rims that—used in combination with Layer's custom designed GO gloves—deliver a higher power-to-push ratio, particularly in inclement weather conditions. 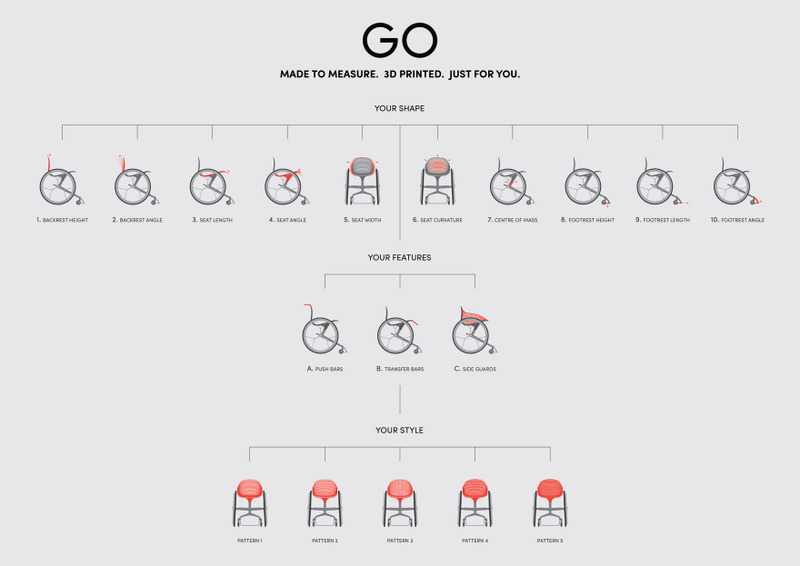 While the Layer Design team has thought through how this could potentially work from a systems-perspective, the GO wheelchair isn't about to hit market anytime soon. 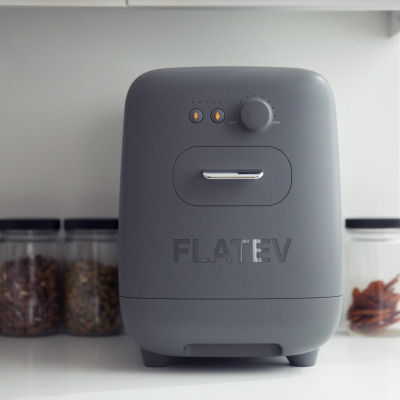 Hubert hopes that by sharing the design and development at this stage, he'll be able to solicit interest to help bring this prototype closer to market. "We have various partners that are set up for this, but it's still a prototype," Hubert says. "We have Materialise as our digital partner to provide the hardware and software solution for the parts that you specify and now we're looking for another partner to help us manufacture the standard components." Next on the agenda for Hubert is finding those perfect partners for some of the more conventional pieces, manufacturing of the frame and wheel assemblies (producing some of the simpler elements of the design that can be pulled from existing physiological precedents associated with age, height, weight, et cetera), as well as distribution and route to market.